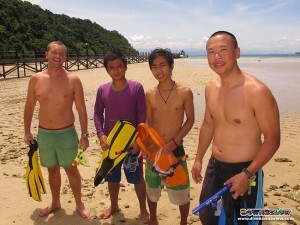 Gaya Island, Kota Kinabalu: Our 2 Divemaster candidates at Downbelow’s PADI 5 Star IDC Dive Centre on Gaya Island in Sabah, Borneo are nearing the end of their stay. Steve and Joseph, form the UK and US respectively, joined us nearly 2 weeks ago to go from recreational to professional divers. Under the watchful eyes of our PADI Course Director Richard Swann and Downbelow’s Go Pro SWAT Team they have been receiving expert training and guidance and are about to qualify as outstanding professionals. The PADI Divemaster qualification is the first professional rating in the PADI System of Diver Education. Divemasters usually continue their diver education often joining an Instructor Development Course to be able to teach diving as PADI Open Water Scuba Divers. We’re already thinking ahead to getting Joseph and Steve to come visit our little slice of paradise again, perhaps for our next IDC?